Aggies and Eagles sweep weekly honors. NORFOLK, Va. – North Carolina A&T State running back Marquell Cartwright was selected as the Mid-Eastern Athletic Conference (MEAC) Offensive Player of the Week, the conference announced Monday. 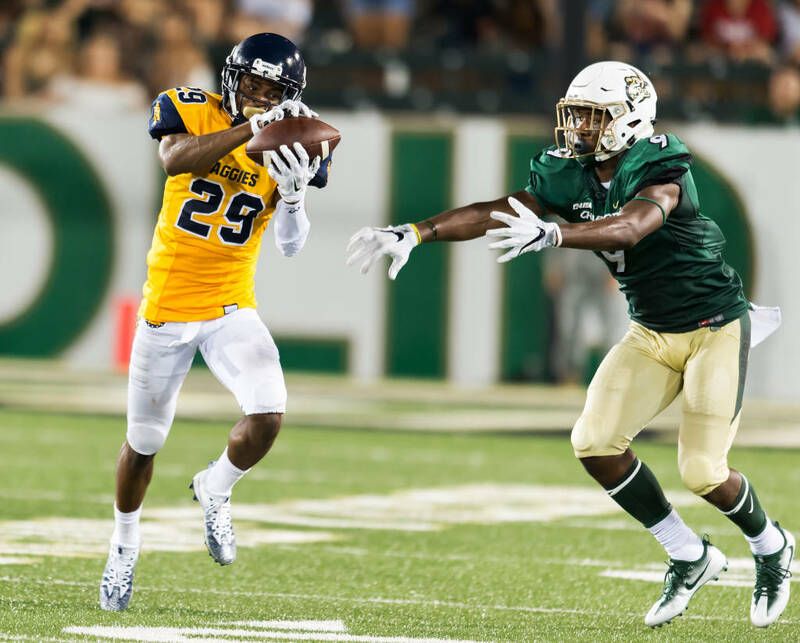 North Carolina A&T State’s Franklin “Mac” McCain III was named the Defensive Player and Rookie of the Week for the second consecutive week. North Carolina A&T State’s Brandon Parker was named Offensive Lineman of the Week honors while North Carolina Central placekicker Aedan Johnson was selected as Specialist of the Week. Cartwright ran for a career-high 176 yards on 17 attempts in North Carolina A&T State’s win over Morgan State. The High Point, N.C. native opened the contest with a bang as he recorded a 72-yard touchdown run on the second play from scrimmage while averaging 10.4 yards per carry. Cartwright finished the contest with eight attempts of six or more yards from scrimmage in only three-quarters of action on Saturday. McCain had multiple interceptions for the second consecutive weekend as he finished with three at Morgan State. Two of the interceptions were returned for touchdowns as he finished with 178 interception return yards, 38 yards short of the NCAA FCS record. He is one of only 28 FCS players to return two interceptions for a touchdown in a game. He has three pick-6’s this season. Parker was flawless on the field this past weekend as he did not allow a penalty or sack en route to a 514-yard offensive performance at Morgan State. With Parker leading the way, the Aggies rushed for 345 yards while averaging 7.2 yards per rush. The senior from Kannapolis, N.C. graded out at 90 percent and recorded three pancake blocks while winning the honor for the fourth consecutive week. Johnson accounted for nine points in North Carolina Central’s comeback win over South Carolina State Thursday night. Johnson’s two field goals in the third quarter helped keep NCCU within striking distance as he also connected on a career-long 41-yarder. Almost a clean sweep for Aggies. A big Spartan salute on jobs well done.